Cook fettuccine pasta according to package directions. Pat thinly sliced chicken breasts dry, season with salt and pepper. Heat 1/2 tablespoon of olive oil in a large skillet over medium high heat, brown chicken on both sides. Remove chicken from skillet and set aside. Reduce heat, add additional tablespoon of olive oil and garlic to pan. Sauté garlic for about one minute. Add chicken broth to pan, increase heat and scrape off browned bits from bottom of pan. Whisk in heavy cream and greek yogurt. Return chicken to pan and let simmer until chicken is cooked through and sauce has reduced slightly. Remove chicken breasts from pan, and set aside to be sliced for serving. Remove pan from heat and stir in parmesan cheese until melted. Season with additional salt and pepper as needed. 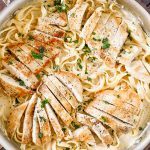 Serve over chicken and fettuccine, sprinkle with additional parmesan cheese and fresh flat-leaf parsley. Full fat greek yogurt, heavy cream and freshly grated parmesan cheese should be used for best results.